Baghdad circa 1944, from University of Texas Libraries at lib.utexas.edu. Rebuilding after war, reformulating the idea of the nation after dictatorship, reframing the culture to include a new generation’s ideas — these are among the reasons to explore the future of Baghdad. The Caliph Al-Mansur wanted to build a new capital to mark the beginning of a new era in the Abbasid Dynasty. Legend says he rode out on a white horse from Damascus and headed into the future. His band of nobles riding along with him reported that when Al-Mansur spotted a location where two rivers came together, he dismounted, unsheathed his sword, and drew three concentric circles in the sand. 1) Water – you don’t have enough for the future. This city will grow and you will run out of water for the people. 2) Landscaping – you need more public parks and gardens. The Caliph denied all the charges, but as soon as the Byzantine Emperor left, he redesigned the water, parks, and used his own money to build a new marketplace – al-Karkh – outside the city walls. 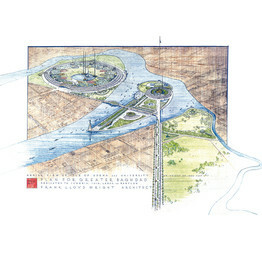 Wright’s plans for Baghdad’s island, from the Wall Street Journal at wsj.com. When the architect was over 90, he received an invitation from the King of Iraq to design a cultural center. When Frank Lloyd Wright reached Baghdad, he asked to be flown over the landscape; aloft, he spotted an island. Baghdad is at the confluence of the Tigris and Euphrates. It was a “eureka (Greek for ‘I have found it’)” moment. Frank Lloyd Wright believed he might be looking at the original Garden of Eden. He wanted to rename the island (then called Pig Island) to Edena. Some of what the architect was looking at called to mind his childhood’s fascination with The Arabian Nights. Under the Abbasid’s fifth caliph, the storied Harun al-Rashid (who ruled from 786-809 CE), Baghdad became the cultural center of Islam, a major trade nexus, and was reputed to be the wealthiest city in the world. Frank Lloyd Wright greatly admired Harun al-Rashid and saw him as a visionary, like himself. Among the designs the architect would recommend was a monument to this legendary ruler. Alas, in July of 1958, King Faisal II died and the projects were stopped. But we still have Frank Lloyd Wright’s designs. Plan for what Baghdad will look like after rebuilding, from Construction Weekly at constructionweeklyonline.com. The Caliph al Mansur began building his round city of peace in the year 145 (Moslem Calendar) or A.D. 762 in Christian dating. The astrologer, Nawbakht, selected the auspicious date for this spot located on the western bank of the Tigris River, opposite an ancient Persian village called Baghdad. In 1870, a French physician who lived in Iraq, found what became known as the Michaux stone, with 12th century carvings telling of a ancient Babylonian city called Bak-da-du. Bagh means god. Dad means gift. So, Baghdad means, essentially, gift of God. In recent years, Baghdad has suffered war and devastation. Now the city must be rebuilt. Can its traditional past – the gift of God, the city of peace – become the future of this place so important in history and civilization? Assuredly, this island, bounded on the east by the Tigris and on the west by the Euphrates, will prove to be the crossroads of the universe. Ships on the Tigris, coming from Wasit, Obolla, Ahwaz, Fars, Oman, Yamama, Bahrein, and neighboring countries will land and drop anchor here. It is there that merchandise will arrive by way of the Tigris from Mosul, Azerbaijan, and Armenia, that too will be the destination of products transported by ship on the Euphrates from Raqqa, Syria, the borderlands of Asia Minor, Egypt, and the Maghred. This city will also be on the route of the peoples of Jebel, Ispahan, and of the provinces of Khursan. I shall erect this capital and live it is all my life. It will be the residence of my descendants; it will certainly be the most prosperous city in the world. – From Gaston Wiet, Baghdad: Metropolis of the Abbadid Caliphate (Norman: University of Oklahoma Press, 1971, 10-11. Economic Opportunities of New (and Renewed) Cities: The Caliph, founding a new capital, saw possibilities in locating at a crossroads. Baghdad, along with Cyrene, Singapore, Brasilia, Abuja, was one of history’s most important new capitals. Puerto Rico pioneered the SEZ concept in the 1940’s. In more recent times, new cities, as Specialized Economic Zones (SEZ) such as Songdo, South Korea, are attracting exchange through incentives combined with crossroads locations offering air, sea, and telecommunications access. Economist Paul Romer advocates the creation of Charter Cities; the next one might be in Honduras. What are the advantages today of specialized economic zones promoting exchange? “The Building of Madinat as-Salam,” The Qadi, Ali b. Abi Ai al-Musaddil at-Tanukhi, from Jacob Lassner, The Topography of Baghdad in the Early Middle Ages: Text and Studies (Detroit , MI: Wayne State University Press), 1970. “Baghdad,” excerpt from K.A.C. Cresswell, Early Muslim Architecture, Part Two. Oxford: Oxford University Press, 1940. Necipoglu, Gulru. Professor, Harvard University. Notes on suggested sources contained in Widener Library, Harvard. “Reclaiming an Iraqi Eden: can the vast marshes in southern Iraq be restored?” by Fred Pearce, The Boston Globe, April 1, 2003. P. C3-4. “US eyes restoring Iraq marshes,” by Alan Elsner, The Boston Globe, May 6, 2003. 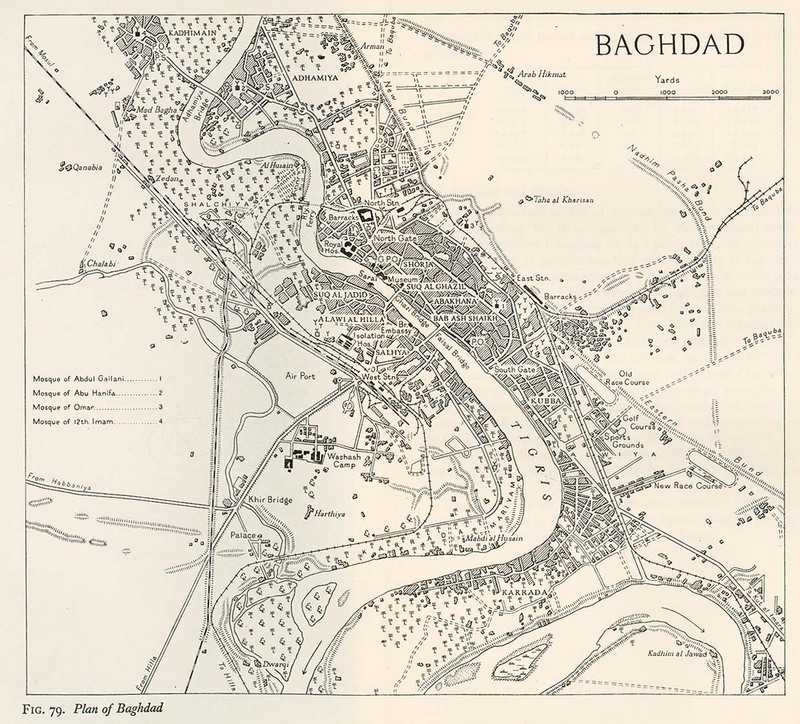 “A History of Baghdad,” by Fouad Kazanchi. Baghdad Bulletin: Dedicated to Covering the Redevelopment of Iraq. Published 16/7/2003. “Building of Baghdad,” Saudi Aramco World, November 1962, Volume 13, Number 9. “The Golden Age of Arab and Islamic Culture,” Chapter 5. By Gaston Wiet. Baghdad:Metropolis of the Abbasid Caliphate. Norman: University of Oklahoma Press. *“Islamic Art, Architecture, and Culture,”ArchNet. This contains a listing of universities and specific professors who were offering courses on these topics in 2004. *“A History of Baghdad,” by Fouad Kazanchi. Baghdad Bulletin: Dedicated to Covering the Redevelopment of Iraq. Published 16/7/2003.